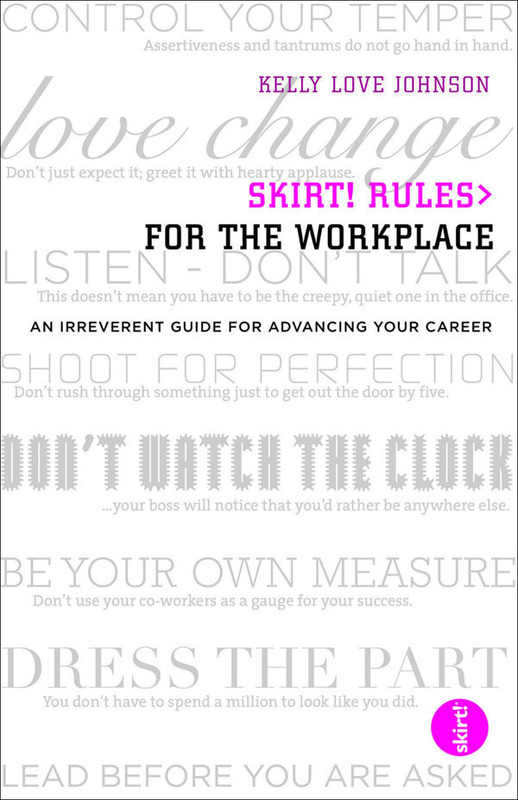 Skirt Rules for the Workplace: An Irreverent Guide to Advancing Your Career (Globe Pequot Press, 2008) is a humorous, practical, tell-it-like-it-is advice for women in the workplace. Overview: Only seven of the Fortune 500 companies have a woman as CEO or President, and nearly 20 percent of them don't have any women at all in upper management. In the bestselling tradition of Nice Girls Don't Get the Corner Office and Who Moved My Cheese, Kelly Love Johnson lays out practical advice for career women who are starting out or who wonder why they're not moving ahead. This is the book every graduating senior, receptionist, and entry-level assistant will steal from her best friend. Johnson shows how speaking out, embracing change, and changing others' perceptions of working women can bring both personal and professional success. Chapters include: "The Alphas and the Betas: Personality Types," "A Feminist Says What?" and "Work Like a Girl." Using personal anecdotes, tried and true tactics, and a directory of resources and Web sites, Johnson shows readers how women can move ahead in the workplace just as well as men, as Ginger Rogers once said, "but backwards and in high heels." #24 on "Best Business Books for Women"